Both the Appalachian foothills (the upper Catwaba valley) and the Appalachian summit in western North Carolina were visited by the de Soto and Pardo expeditions in the middle 1500s. The Berry site, which was occupied during this time, appears to have been the town the Spanish described as Joara, when it was visited by the de Soto expedition in 1540 and by the Juan Pardo expedition from 1567-68. After the Spanish expeditions, the Cherokee in and near the Appalachian Summit were insulated from European contact for a century. Some degree of trading and raiding were carried on with the Spanish settlements to the southeast. Then, in the 1670s, trade relations were set up with Virginia traders. In the early 18th-century English traders began to push west through the Blue Ridge mountains and along the upper Piedmont of South Carolina and Georgia. Here they found the Cherokee, a populous people in a widely scattered collection of towns. The Late Qualla phase represents Cherokee culture during this time period. The Cherokee remain somewhat isolated until the close of the Tuscaroa War in 1713. By the 1730s European diseases had spread to the Cherokee country. A smallpox epidemic in 1738-39 destroyed half of the tribe. During the mid-century the Cherokee were increasingly drawn into European rivalries and English, and later American, expeditions into the heart of Cherokee territory destroyed towns and killed many Cherokees. In these wars the Cherokee lost much of the political and military power they had previously possessed. Beginning with the Treaty of Hopewell in 1785 and culminating with the Removal of 1838 each treaty cost them more and more of their mountain homeland. The pottery of the Late Qualla phase reflects the stability and conservatism that mark the beginning of this phase. 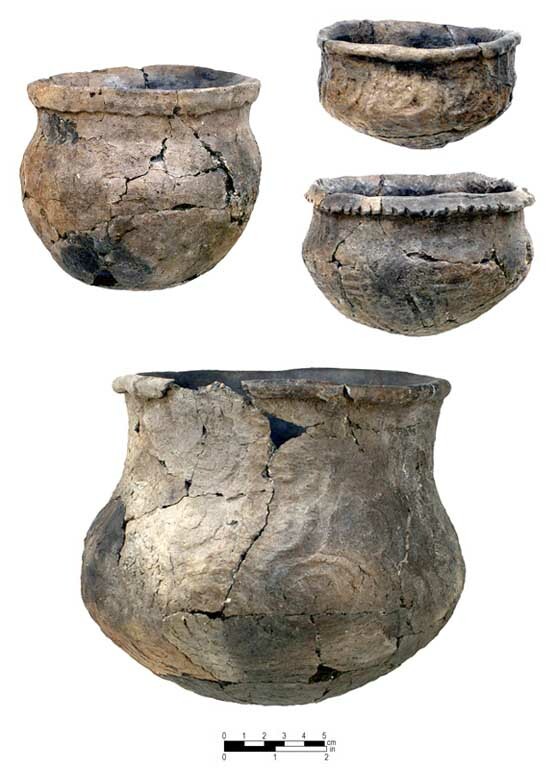 No drastic changes demarcate the Late Qualla ceramics from pottery of the Middle Qualla phase. Late Qualla pots from a burned house at the Townson site. Pottery from the Townson site, which dates to the second half of the Late Qualla phase, is similar to earlier Qualla pottery, but decorations are bolder in form and more crudely executed. The Cherokee probably built both circular and rectangular houses. Throughout the Southeast, circular houses were used mainly as winter dwellings and rectangular houses were summer dwellings. After about 1776 rectangular houses became the dominant form. House form at Townson also differed greatly from earlier rectangular Qualla houses. Instead of individual posts set in the ground, the walls of the house at Townson were formed by split rails laid one atop another and anchored to four corner posts. Cracks were chinked with clay. The house probably looked much like a contemporary Euro-American log cabin. However, inside the house was the traditional central puddled-clay hearth found in earlier Cherokee houses. A very similar Cherokee house was described in a letter relating the experiences of a soldier who participated in the 1776 attacks on Cherokee towns. As house types changed during the Late Qualla phase, so did village configurations. Townson site consists of houses scattered along a terrace, whereas Middle Qualla villages were compact and usually stockaded. This process of population dispersion intensified as acculturation and pressures to change increased . By the time the Cherokee were forcefully removed in 1838 most families lived in isolated farmsteads and small hamlets. Some Cherokee habitations had large numbers of artifacts, including non-native commercially manufactured items, while others contained mostly native-made items. These differences probably reflect varying degrees of acculturation and participation in the colonial market economy. Subsistence practices also changed. The Cherokees readily adopted Old World animals, and most families kept horses, cows, pigs, and chickens. Although the population became more dispersed, town houses continued to be used and rebuilt at the same locations long after the main villages had been abandoned. The religious and ceremonial realms of Cherokee culture retained their traditional form and practice.